Commander Josh Wilson joined the RAN from Bendigo as a Direct Entry Officer in 1997 after working as an Economist in the Victorian Government. 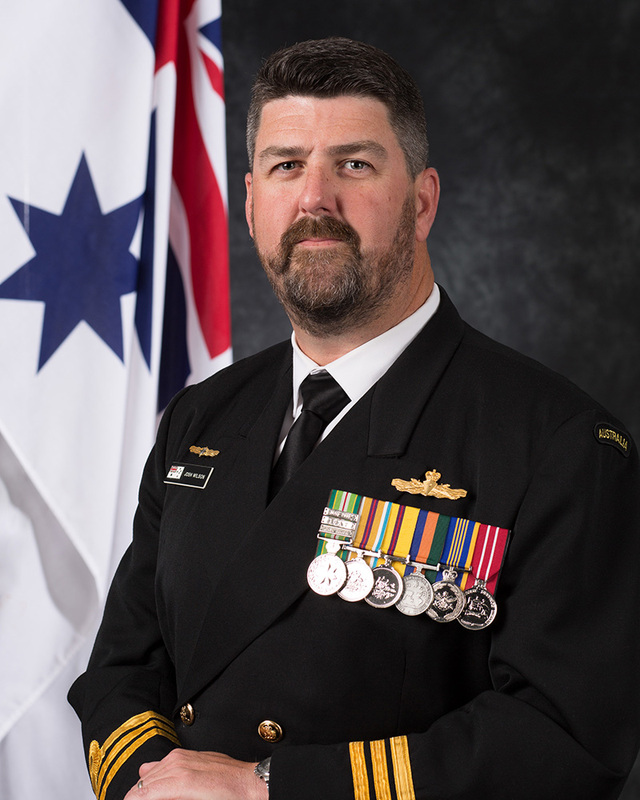 He undertook initial training in HMAS Anzac, seeing operational service in East Timor in 1999, and qualifying with a Bridge Watchkeeping Certificate in 2000. He completed Patrol Boat Navigation Training in 2001, and served in this role in HMA Ships Bendigo, Launceston and Darwin. It was as Navigator of HMAS Darwin that he first deployed to the Middle East Area of Operations (MEAO), initially tasked with enforcing UN Sanctions against Iraq, and then supporting the subsequent invasion in 2003. In 2004 he undertook training as a Principal Warfare Officer and posted to HMAS Warramunga as the Operations Officer. After additional training as a Force Warfare Officer (Air) he returned to Warramunga for a second MEAO rotation, supporting security operations in the Northern Arabian Gulf in 2006/7. On returning to Australia he took up a position at the Principal Warfare Officer Faculty as an Air Warfare Instructor. He was subsequently selected as the Executive Officer of HMAS Ballarat, commencing in 2009. Under the ship swap program, he transitioned to HMAS Stuart, and then deployed to the MEAO for a third time, conducting operations combating terrorism and piracy in the Arabian Sea and Horn of Africa. On completion of the deployment he oversaw a second ship swap, this time to HMAS Anzac in 2011. On Completion of Staff Course, in 2013 Commander Wilson was a Project Manager in the Rizzo Reform Program, examining capability management within the Navy. He was then posted as the Deputy Director of the Air Warfare Destroyer Capability Implementation team where he was involved in the introduction of the AWD into the RAN. In 2016 he was posted as the Staff Officer Above Water Warfare at the Australian Maritime Warfare Centre before being selected for Command of HMAS Brisbane (III), a role he commenced in December 2017. Commander Wilson is a graduate of the Australian Command and Staff College, and holds a Batchelor of Business (Economics) from La Trobe University Bendigo and a Masters of Military Studies from the Australian National University.